Dr. Catherine Frieman in a field in Cornwall with survey equipment. Credit: ANU. 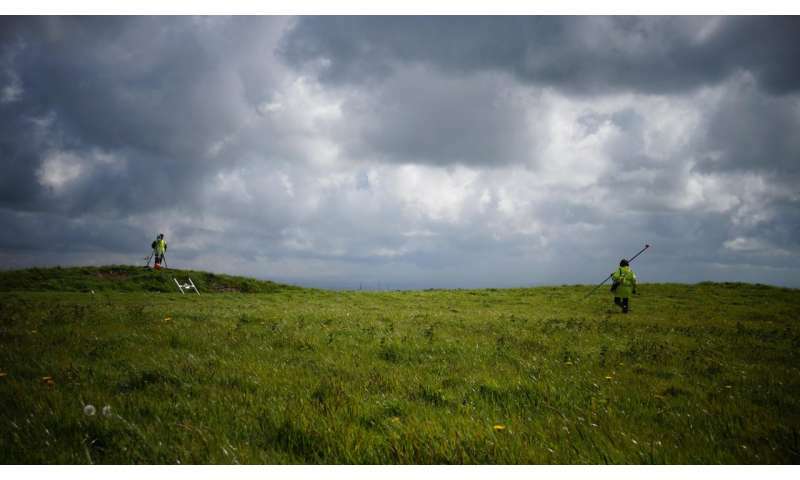 An Archaeologist at The Australian National University (ANU) has discovered a prehistoric Bronze-Age barrow, or burial mound, on a hill in Cornwall and is about to start excavating the untouched site which overlooks the English Channel. 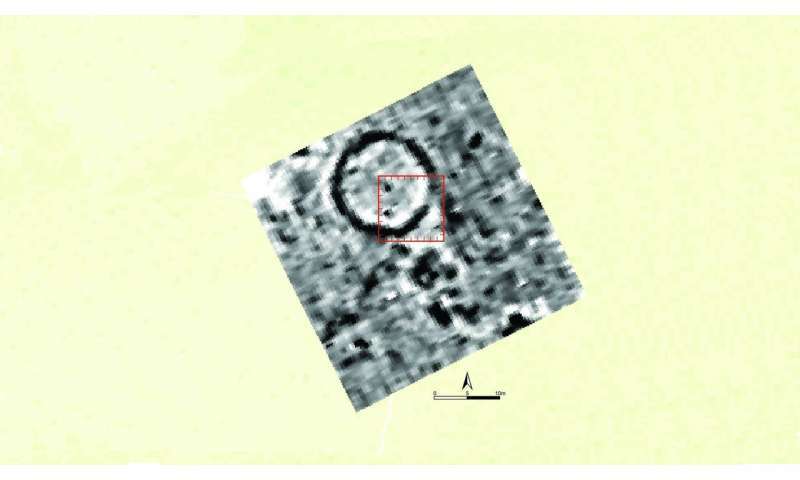 The site dates back to around 2,000 BC and was discovered by chance when ANU Archaeologist Dr Catherine Frieman, who was conducting geophysical surveys of a known site outside the village of Looe in Cornwall, was approached by a farmer about a possible site in a neighbouring field. "He told us about a 'lump' on his land and that nobody knew what it was, so he asked us to take a look at it," said Dr Frieman, who is a Senior Lecturer in the ANU School of Archaeology and Anthropology. "So we ran our equipment over a 1,600 metre square area and sure enough we found a quite obvious circular ditch - about 15 metres across - with a single entrance pointing south east and a bunch of pits in the middle. "We said 'oh my god - that's definitely a barrow'." Dr Frieman said ancient barrows in the UK are usually always burial sites, although in Cornwall they can vary and might not contain human remains. "We just don't know what we'll find until we start digging," she said. "In Cornwall, human remains are only found in about half of the barrows that have been excavated, and not very many have been excavated compared to other parts of Britain." Dr Frieman's work has overturned the accepted belief that Cornish barrows don't have ditches. She said of the surveys involving her team, 90 per cent of barrows have ditches. Dr Frieman has arrived in Cornwall and is assembling her team. They will start excavation work on Easter Saturday and have 14 days to complete the dig. "We want to examine the negative features that look like pits. They may be for holding up posts of a timber structure inside the ditch, or they could be pits that have small cremations in them - something you do find in Cornish barrows. "Cremated human remains in pottery in pits can tell us all sorts of things about the people who were there." Dr Frieman said the things put into burials was usually the most interesting. Stone tools like flint knives and ground stone axes and pottery have been recovered from nearby Cornish Barrows, but gold objects and ornaments of exotic material were also occasionally deposited in them. "We think these coastal waters were really important for the movement of metals in the Bronze Age. Tin is a famous Cornish resource and Cornish Tin is really important to the western European Bronze Age," she said. 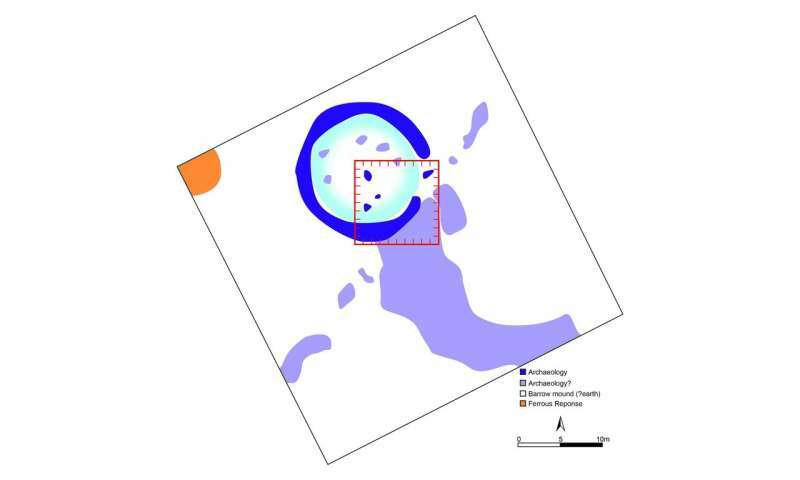 Dr Frieman has been able to mount the geophysical survey and excavation work with the help of Discovery Early Career Researcher Award (DECRA) and a contribution from the ANU College of Archaeology and Anthropology. The excavations are being carried out in collaboration with the Cornwall Archaeological Society, the Cornwall Archaeological Unit, and with support from the National Trust who own and manage the site. Now they will want money to look for the wheel.